The pairing of Australians and Cane Toads works well. Almost as well the pairing of pavlova with pepperoni! Although, come to think of it, while the Cane toad is an introduced species, so are its colonial counterparts … but I digress! 77 years after ‘experts’ deliberately introduced the Cane Toad (Bufo Marinus) into the wild, this alien animal has infested nearly every habitat in the country. From a gene pool of just 102 toads in first release, numbers are estimated at above 200 million. It has no natural predators. Panic? Call in the National Guard?? Stop watching the B-Grade Horror movie??? NO! Because the pairing of Australins and Cane Toad RACING actually DOES work!! Downunder here in OZ, the toxic toad has become an Australian ‘cultural’ icon. And along with the ‘unique’ (yes, that’s a euphemism for ‘tasteless’) novelty gift items and a bizarre, cult-status documentary about the sad story of their arrival, they’re an obvious choice for a day at the races! Because the thrilling unpredictability of racing the arguably unintelligent, ungainly and UGLY Cane Toad is at least as logical as racing, say, horses. Or dogs. Or even camels! And for race organiser and caller ‘Fats Thommo’, of ‘Thommo’s Toad Races’, it’s a whole new industry!! A chance chain of coincidence and we had ring-side seats for Thommo’s virtuoso performance as Cane Toad race organiser AND caller at the July 2012 Kununurra Agricultural Show. Where, ashamed to call myself an Australian without ever having attended this most prestigious of Australian sporting events, I lost my Cane Toad Race virginity! The Cane Toad Race Card – AND the prize! I’m sure the high gained from bufotenin, the chemical classified as a Class 1 drug secreted by the poisonous pest, is at least partly offset by the revulsion one would feel from ingesting it via toad-licking. That probably means instances of bufotenin addiction are so rare, they may soon appear in TV shows featuring hospitals or emergency rooms. And I’m sure bufotenin ingestion played no part in Thommo’s crowd pleasing antic AND fabulous photo opportunity (see top photo)! Cane Toad racing isn’t just about the race. Getting the venemous villains to the starting barrel is a lengthy process, starting with the auction. Auction? With an cry of ‘C’mon, you tight-a**ed tourists’ (and perhaps a nod to a previous profession? ), Thommo launched the crowd into a bidding frenzy. Where strangely, purchasing your very own noxious nuisance for an average of $AUD50 seemed not just normal, but highly desirable! Having thus raised over $AUD500 for the Kununurra Wildlife Rescue, the poisonous predators were ready to ‘line up’. Because the concept of racing doesn’t come naturally to untrained Cane Toads, a few modifications to the standard racing format are required. There’s no point setting Start and Finish lines, gates or racing lanes; and a starting pistol would be about as useful as a sandbox in the desert. 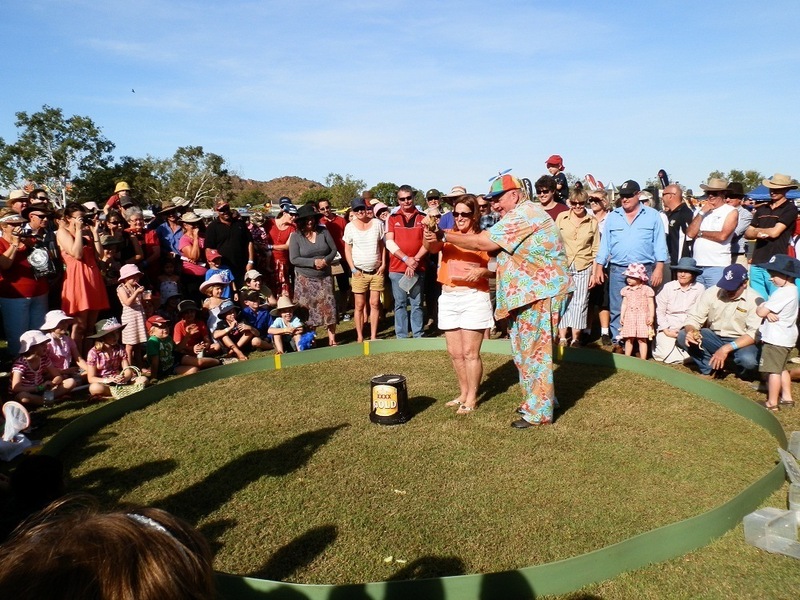 For Cane Toad racing, the ‘track’ becomes a well-defined circle and the ‘starting gate’ a bucket or barrel in its centre, into which the abject amphibians are placed. This wasn’t as simple as it sounds. As the crowd gathered around the ‘track’, Thommo insisted each new owner personally place his or her toad in the barrel by hand. But as the Cane Toad has taken nearly 77 years to reach Kununurra from its first release in Far North Queensland, the art of toad-wrangling is virtually unknown. Which placed the more squeamish at a disadvantage that Thommo was quick to exploit. ‘Give us a kiss and I’ll do it for you,’ he offered. ‘I’d rather kiss the toad,’ one feisty owner replied. After seemingly endless rounds of dropped toads, escapees, posing for photos, toad-kissing and shrieks of revulsion, the toads were ready to race. With the owner of the first toad to reach the circle’s perimeter after the barrel was lifted (ie the ‘winner’) to receive a highly desirable prize (ie a Thommo’s Toad Races T-shirt and 6 bottles of wine cane toad juice), the stakes were high. So Thommo issued strict instructions that the crowd was not, under ANY circumstances, to interfere with the race outcome. With a flourish, Thommo removed the barrel and revealed a clutch of 10 toads, blinking in the sunlight after their enforced rest in the dark. Then, despite wild – and desperate – shouts of encouragement, nothing continued to happen. The cunning cane toads weren’t playing. Thommo entered the ring and made threatening noises. That did the trick! Suddenly, a freedom-seeking toad saw an opening in the crowd, took off like a rocket, leapt the barrier like a seasoned Olympic hurdler and disappeared into the crowd, who obligingly parted. Its fearsome friends followed. Thommo declared the race – and my virgin experience – over. @Diane – Haha, that sounds like great fun, and not dissimilar to the Cane Toad races. Are you sure you’re not an Aussie in disguise?? So much fun! Come to Canada and see the grasshopper races! @diane b – The thought of a toad in my mouth makes me shudder!! But maybe the poison glands are part of the attraction?! @Christopher Allen – It’s a public service I perform so visitors to OZ don’t show themselves up by acting surprised at all the weird stuff they encounter!!! @Debbie – Haha, that sounds like fun – but this is BEYOND jumping frogs!! @Robyn – They’re edible – if you can stomach the thought AND the poison!! @David Newton – HAha, I’m with you on that one!!! @Wends – Haha, that’s one way of getting rid of the competition!!! @SFlaGuy – Hahaha, I can relate to that! But our downunder documentary about them shows a young girl dressing a giant toad in dolls clothes and playing with it!! Weird, huh?! @Ann – We were assured they are disposed of humanely, and the proceeds went to animal rescue, although I’m probably the only one who sees the irony in that. @Glen – The last rain I saw was on 12 June!!! Any blog post that starts with the phrase “The pairing of Australians and Cane Toads works well” has to be read. Great fun that – even if they did need a bit of encouragement! Your pics always look so sunny – does it EVER rain over there? oh no the poor toads. it’s not their fault people think they are ugly or bad. I had to skim quickly down to comments before any image loaded properly. yrs truly, great big animal sook. When I think of cane toad racing I think of how fast my mom ran the first time she found one sitting in the dogs water bowl. Oh yeah – we have those in South Florida too. This is cool and the toads are numbered white haha. In the Philippines where we come from, we have yet to probably introduce the toad race though some people have learned to eat them before racing them for the finish. Are those edible? I’d like some fried frog legs! I laughed out loud reading this, Red. It’s hilarious. BUT notwithstanding that, the Cane Toad problem is huge and it’s good that people like you are putting it out there. Keep up the illuminating work. We have a jumping frog contest in Calaveras County California but I’ve never heard of racing poisonous toads! Oh my Lord. It doesn’t get any more hilarious than this. Thank you for the lesson in toad racing. I’m still smiling. They are revolting creatures. I can’t believe anyone would put the poisonous creatures in their mouth.He must have had the poison glands on the outside. We don’t seem to have as many as we used t but in summer I do see them squashed on the road. @Joan E – They’re one of the most adaptable creatures on the planet, more’s the pity! @Aleah – If I HAD been foolish enough to put a toad in my mouth, the amazing sight would have been me spewing!!! @Erika – I don’t like them much either, but it’s a pretty funny thing to watch!! @MJWC – See? You can probably find lots of new ‘virgin’ things if you set your mind to it!!! @Indrani – Yes, great fun if you’re not actually touching the toads!!! @Mary – Funny, that’s what I thought too!! It’ll all be downhill from here experience-wise now!!! @Andrew – It’s too cold NOW, but what if they turn up in summer?? Once they’re in, they’re IN! @Windsmoke – I’m SO with you on that … just the thought is enough to make me squirm!! @Sallie – Hahaha! LOVE the idea of chicken bingo!! I can see that taking off over here BIG TIME! @River – I think SA is safe – for now. Although I did hear one had hitched a ride on a train?? Shuddering is the only understandable response!!! @Saucy Kod – Yeah, betting is kind of a national sport!!! Glad you enjoyed it – but really, you had to be there! The atmosphere was amazing!!! @PDP – It was only a matter of time before they made it to WA. A few good wet seasons and they’ll spread all across the Top End no matter what anyone does. But WA gave it a red hot go, and hopefully that will keep numbers down for a while yet. @Ken G – Yes, but now you’ll have to come down here and see it for real!!! @Jane & Lance – Yes, I suspect Thommo’s presence is the key to the success of this race! As for the ‘fashion’ statement, it’d fail for sure without the Cane Toads! @Cathy – Haha, it’s a pretty grim image all right! But us Aussies will turn our misfortunes into enjoyment any day!! @FruitCake – Hahaha, I was a spectator from start to finish (mainly looking on in disbelief)! Unlike many races, this one was bet-free. Well, officially anyway!! So maybe my virginity is intact??!! @Dianne – And there you have in a nutshell why toad racing isn’t the commercial enterprise of, say, horse racing!!! Never heard of something like this. Great pictures, sounds like loads of fun there. It has been many years since I could say I was a virgin, but hey… I am a Toad Cane virgin too!! Didn’t Opie on Andy Griffith race frogs before? Hmmm maybe it was another show. I didn’t realise that had reached WA. Horrible creatures, hope they never reach my place… hopefully it is too cold for them. OK they are the most disgusting things ever, that guy must be just a little CRAZY!!!!! We’ve worked so hard to keep them out of WA it looks like we may be losing the battle which is extremely disturbing. Us Aussies will bet on anything won’t we? cane toad races, camel races, two raindrops running down a window…. Cane toads are ugly little buggers and so far I don’t think any of them have made it as far South as Adelaide. They make me shudder, and there’s not much that makes me shudder. A cane toad was found in the suburb of Sunbury last week which is only about 30 clicks from Melbourne. No way in the world would i put one in my mouth YUK!!. I’ll bet the crowd really did part as one jumped clear. One turned up in Melbourne last week, but it is too cold for them here. Horrible things. What a fun event … Went to something similar in a pub at Pt Douglas … My toad left the track and was never seen again! We have frog jumping contests in these parts, but the frogs aren’t anymore willing to jump than the toads are to race. So did you do any toad licking? When I saw the reference to cane toads on my blogger dashboard my gut [yes – gut] reaction was DISGUSTING. Then I saw the photo of Thommo with a toad in his mouth and I realised I do not have a word adequate enough to convey how much worse than disgusting Thommo’s idea of a french kiss really is. Disgusting, too, that the dreaded CTs have managed to cross the continent. But how very Australian that we should make fun of the bungling that has made this country what it is today… and not just make fun of the bungling, but make a quick buck on it to boot. I can’t say thanks for the warts and all report yet because we’ve yet to learn the whole story… Did you, or did you not, place your own toad in the ring, or did you celebrate the loss of your virginity by giving the toad-licker a kiss? Geez, I hope I can get the picture of the guy with the toad in his mouth out of my head today. I had to laugh at this post, OZ. People can make competition out of just about anything. Looks like the crowd was really into it. Now, who said that Cane Toads were dull? We can truly say that we have never heard of anything quite like this, although we suspect that it is Thommo rather than the toads who is the main performer. We think, quite possibly, that he could make watching paint dry a spectator sport.And, as for Thommo’s pyjamas [at least that is what we think they are]surely we shall see them in all the new fashion house collections next season….and perhaps a cane toad or two, or two million?!! !